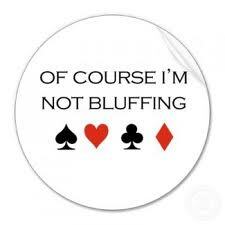 Bluffing in online poker is an important skill to learn and have as part of your poker arsenal. The most important skill is being able to pick the right situations to execute a poker bluff otherwise you can get yourself into all sorts of trouble. Bluffing deceives other players into thinking you’re hand is better than theirs when it really isn’t. But in order for bluffing to work a good percentage of the time, other players have to actually believe you and think you’re holding a strong hand. Typically, the success rate of bluffing has much to do with the info you assume about players, and what you’ve learned from playing against them. A Poker Bluff is when you try to deceive your opponents into thinking that you are holding a stronger hand than you actually are. You do this by making bets that represent that stronger hand displaying your perceived strength & confidence to your opponents in the hope that they believe you and fold. Bluffing can be a risky strategy if done in the wrong situation, there is no point in bluffing when your opponent holds the nuts (best poker hand available in that situation), he’s not folding to your bluff. So lets take a look at 5 situations which are common times to bluff in online poker and where your chances of success will be much higher. When few players are in the pot and you were the initial raiser pre-flop it can be an ideal time to try a continuation bet bluff to take down the pot uncontested after the flop. This is because when it’s heads up or when you’re playing against only 2 other players, the chances are much higher that neither of your opponents has made a good hand with the cards on the flop. A continuation bet is where you have shown strength before the flop by making the largest raise. You then continue to show strength by making a further bet after the flop irrespective of whether you have hit the cards you wanted or not. Many novice players overuse the continuation bet in the wrong kinds of situations against the wrong sort of players and the wrong sort of flops. Knowing how your opponents play is essential before you use this type of bluff. Tight players that fold easily are good continuation bet bluff targets. Its also important to assess the cards that have come on the flop and see if you think they are cards that might have helped your opponent by making a good hand. Again you do this by assessing your opponent and the type of player they are and try and think of what range of hands they may hold that they called your big raise before the flop with. If you think it’s likely the flop missed your opponent then go ahead and continuation bet. If they don’t fold, think twice about bluffing again. You have to figure out if they have already made their hand on the flop or whether they have a drawing hand and are just calling to see another card in the hope they hit their draw. If the next card is a safe card and you think they were on a drawing hand you could try another bluff on the turn to see if they will fold. The beauty of online poker is that many players will respect your raises for a sign of strength. This is slightly different to live poker games where players seem to find it a little harder to fold. Unless your opponent has a real premium hand, the majority of the time they will not play back against you, and will just fold to aggression before the flop. So for this exact reason a 3-Bet bluff before the flop can be extremely profitable if used in the right situation. A 3-Bet is when you re-raise someone who has already raised before the flop. It is called 3-Bet as the first bet is the big blind, the second bet is the initial raise, and the third bet is your re-raise. A 3-Bet bluff refers to 3-betting with hands that you normally wouldn’t re-raise with, with the aim to take down the pot before seeing a flop. By re-raising, it will most likely force the initial raiser out, since it will be difficult for them to play without a premium hand, especially when out of position. Again you need to know a bit of info about the type of player your opponent is before executing this move. Are they known for making initial raises from early position without holding a premium hand, if so they are the perfect target for this move. When you get the impression that your opponents are playing with scared money then you have a much higher chance of success of pulling off a bluff. Scared money refers to when your opponent is tentative of making any actions because they are scared of losing the stack of chips they already have. There could be any number of reasons why your opponents are playing with scared money. It might be many hours into a tournament, just before the money bubble bursts and players start to get paid and your opponents might not want to risk any of their chips until they are in the money. It could be a cash table where your opponent is playing at a stake level he cannot afford and it scared of losing what to him is a high proportion of his bankroll. You should always be keeping an eye out for opponents that seemed scared to put any chips into the middle. Once identified then you can single them out and pounce on them, taking advantage of their nerves. This sounds ruthless, but hey… poker is about being profitable and winning money, when it is on offer you have to grab it. To pull this off the other players must respect your game. This largely depends on how other players at the table perceive your previous play. If the other players think you’re a decent player and say stuff to you like “nice hand” in online chat, these players will be more likely to fold to your bluffs if you pick the right spots, because they’ll be more likely to think you have a good hand when you’re betting out strongly. Play the bluffs exactly the same as you would if you were value betting a strong hand, and until your bluffing attempts gets called and your opponents see what you were doing, you have no reason to think they will think you’re up to something. The power of position is massive in poker. Being in Position refers to being the last player in the hand to act. The advantage is that before you have to make any decisions or put any chips into the pot you have seen how all your opponents have acted and can use that information to decide how to act. On the other hand, all your opponents have had to make their decisions without having that information about you as you have not acted yet. This is why the positional bluff is such a powerful weapon in any online poker player’s arsenal. Bluffing before the flop when you have position on the button or in the cut-off seat (1 seat before the dealer button) after everyone else folds can be a great time to bluff and win the pot with the blinds in without having to see any cards. Ideally you want to be sure that there are tight players left in the blinds who you know will fold unless they have a really good hand which is more unlikely in the blinds as remember they have not chosen to put the blinds in, they are forced to do so irrespective of the cards they are dealt. Even when you get called, you still have the advantage of position throughout the rest of the hand and can consider a continuation bet bluff even when you miss, as discussed in point 1 above. The position bluff is not limited to before the flop, it can be used in any situation where you are the last player to act and all your opponents have shown weakness in their actions. The final situation to look at here is when there is a Scary board on the table which also make for good bluffing opportunities. A Scary board is when the community cards in the middle of the table obviously give a number of possible opportunities to make a strong hand. Its the kind of board that you look at and you immediately think “I hope my opponent hasn’t got an X card as if he has then he has just made three of a kind”. Well guess what, if you’re thinking that then your opponent probably is too and is much more likely to fold if you show strength by bluffing. One example of this is when the board is paired, such as a 5-5-7 board. Here the first thought is does my opponent have a 5 in their hand to make three of a kind. Well when there are only a few players involved in the pot, the probabilities suggest that there is little chance anyone has three of kind with a 5 in their hand, and in an un-raised pot or if there was a smallish pre-flop raise, then it would be feasible that you can represent holding a low card in your hand such as a 5 and in these situations a bluff might work well. Carefully evaluate the hand if you do get called, since the other player might just have the card you are trying to represent and may be setting a trap, although fairly often they will have a weak hand they can’t continue after a second bluff bet on the turn. So now you know what a poker bluff is and we have been through 5 common situations where a bluff has a much better chance of success. This is basic stuff for all poker players but but important, nonetheless. So, to summarize, pick your situations wisely, know your opponents and know your image at the table and don’t bluff to the point that everyone knows you are bluffing.